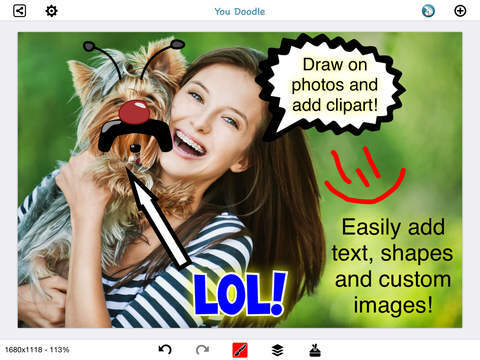 *Developers* - Easily embed You Doodle in your app on iOS 6 and up. 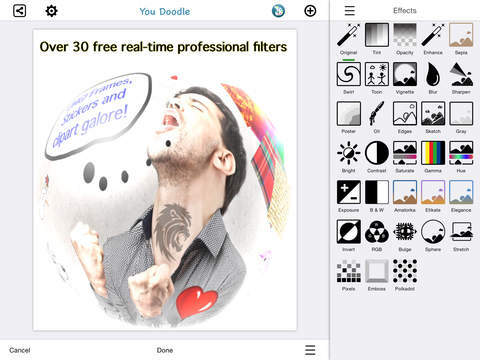 You Doodle - Where everyone creates amazing art! I'm Jeff Johnson, just one guy who created You Doodle just for you. I hope that you find the app useful and fun. I am constantly updating and improving the app and I listen to feedback and feature requests. Please email me at [email protected] if you want to suggest something or report a bug. Turn your art into a T-shirt! Share to Instagram, Flickr, Facebook, Sketch Book, Twitter, Tumblr, Dropbox, Weibo, Email, Text Message, Camera Roll, Printer or Copy to Clipboard. Download now and never need another photo editor app! You Doodle is created by @jjxtra (Jeff Johnson). I'm just one person and do all the development, so please leave a review with feedback, bug reports or feature requests. It really helps. Download now to enjoy hours of fun!